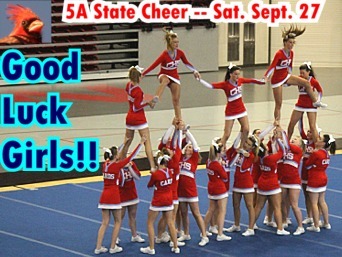 With an average 3.87 GPA the Collinsville High School Cheerleaders topped the 21 other 5A cheer teams at the state competition September 27th earning the title of 2014 5A Cheerleading State Academic Champion. They also performed well in the floor competition but finished in the pack of those 21 very talented 5A teams with Carl Albert taking that state title and Deer Creek the runner-up spot. The CHS cheerleaders arrived early with their red backpacks (& stayed late) at the Lloyd Nobel arena on the University of Oklahoma campus in Norman, OK Saturday. The state competition included performances by 17 class 2A teams, 16 3A teams, 19 4A teams, 21 5A teams, 15 6A teams, 10 large co-ed teams, and 8 small co-ed teams. "And just to clarify ... I'm poking a little fun here ... but of all the teams at regionals and state the past two weeks no team looked sharper than the ladies from Collinsville!"